Tuscany calls in spring, with its lush green hills dotted red with poppies. Summer tempts with fields of sunflowers. In the fall winemakers welcome the grape harvest. Tuscany offers the best of history, scenery, small-town tradition, hearty food, and local wine. Explore art-filled hill towns and savor the views. Stay in a restored farm house on a working farm or vineyard near Buonconvento or Montalcino. Day trip options: Siena, San Gimignano, the Chianti Valley, Montepulciano, Pienza, Volterra, Cortona, Florence, and more! Day trips: Siena, Pienza, Montepulciano, San Gimignano, and, of course, Florence. Lucca, Volterra and Pisa are also longer day-trip possibilities. 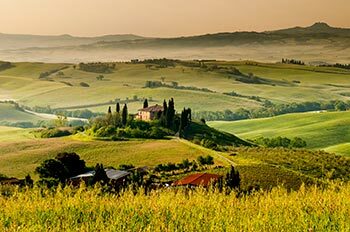 Sightseeing: The flower-lined, cobblestoned streets of Pienza, the unforgettable Duomo and Piazza del Campo of Siena, the wonderful scenery of the Chianti Valley, and the 13 medieval towers of San Gimignano. Right in your own backyard, wander the streets of the classic hill town of Montalcino, one of Untours’ home villages, admire the austere beauty of the Sant’Antimo Abbey framed by cypress trees, or visit the open-air market on Saturday in your hometown of Buonconvento before enjoying an unpretentious but delicious meal at Da Mario, one of our favorite local restaurants. Off-the-beaten-track treasures that can’t be beat: Wander the tiny little medieval village of Murlo, very near our hometown, visit the Medicean mineral bath at Bagno Vignoni and stop by to take a dip in the bathing pool of a natural spring at Bagni di San Filipo. Discover Montepulciano by getting lost on the back road through Monticchiello, picnic at Abbazia di San Galgano, the ruins of a sixteenth-century abbey, still a beautiful and well-maintained piece of architecture, ruin or not! Florence Accademia and Uffizi Gallery Tour - Skip the line! One or two weeks in a farmhouse apartment, often on a working vineyard with stunning countryside views. An orientation with our acclaimed local staff person, who is full of excellent recommendations for your sight seeing, practical advice on driving and parking, and a listing of local events happening during your stay. A regional map, local information, plus our own Untouring Tuscany guidebook, researched and written by Untours staff, full of the best restaurants, sightseeing, and other suggestions. A local cultural activity, like a luncheon and a guided tour of a local abbey. Join us for optional activities like pastamaking, falconry and horseback riding. Truffle and herb hunts, wine tasting, cooking, and more. Traveling within the next month or two? We sometimes have special rates available on selected properties.